Italian Court | Průvodcovská služba Kutná Hora p.o. The Italian Court houses the town hall, minting exhibition and royal palace, as well as the audience hall and a Gothic chapel with mural in the style of art-nouveau. The visitors can choose a shorter or a longer tour, they can visit the Museum – Discovering the dark side of Kutná Hora, or the Museum of local legends and ghosts. You will discover a medieval currency with the same power and use as modern Euro, you will find out where originated the American Dollar, and you will learn about medieval political decision, which influenced the course of history in Europe. The royal chapel combines the splendour of gothic architecture with the marvels of frescoes in the style of art-nouveau. The ticket office offers a wide range of souvenirs, such as handmade copies of medieval coins minted in the Italian Court (prague groshen, parvus, thaler). We also offer publications on medieval minting and the town of Kutná Hora, pottery and glass, memory stamps and other collectables. A demonstration of medieval minting techniques. 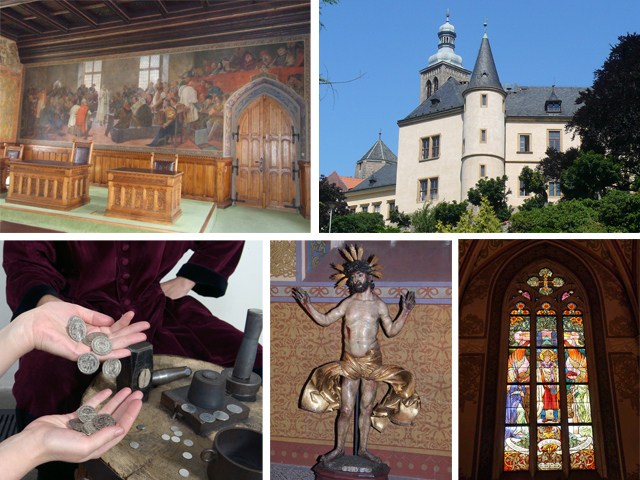 Experience the work of a medieval coin maker and visit our tour. Take a photo in the coin maker’s robe and pay good attention: You can get a certificate for you coin-making skills, provided you don’t break a finger or two. The price is 149 CZK per person. Reservation necessary. We can prepare tours with a guide or a demonstration of coin-making outside of the opening hours at your request. It is necessary to book the tour at least one week in advance.For groups of 12 persons and more the price is 155 per person. Smaller groups pay 1 700 CZK.